If you're looking for an interior design idea to update your child's bedroom, but you have limited space, then a level bed can be an option. You can combine your child's bedding with whatever it takes. A study desk, a wardrobe, or another bed for a roommate with her? Can! Previously, you should first see the layout and some of the options available. If we just focus on what you will place under your child's bed, then the options include a desk for study or a wardrobe. The ladder to reach the bed above should also be placed at the edge to provide sufficient space in the lower area of the bed. Not only that, you can also choose the material you want. Whether it's wood, iron, or anything else. Adjust to your needs and conditions. Well, here are some level bed ideas for your child.Not only is your master bedroom the only one to get the most attention to the dream decor and the furniture of choice, the child's bedroom should also get the same attention. 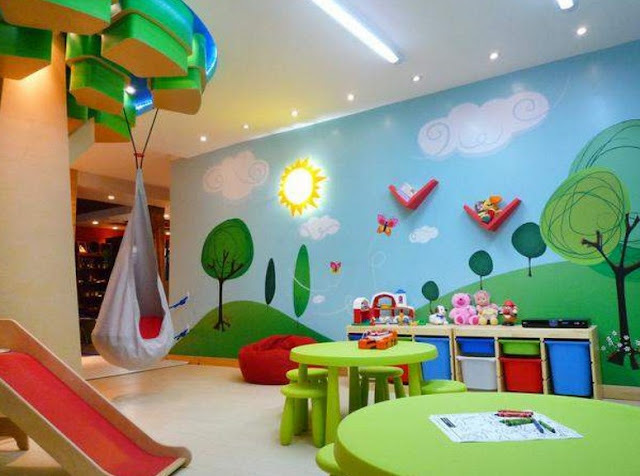 The artistic touch of a child's room will have a tremendous impact on their development. Interior design of the child's room does not need luxury, even so with the choice of furniture, you simply adjust with what their interests and passions.The main thing is comfort, then how to include the artistic elements that will definitely make them more comfortable and this bedroom as if it is the center of all their activities.From Bonne Soeur, a French design services company, how to design a dream bedroom for this child so looks very stylish and very personal.With a design that is very attentive to the character of the child, then design the bed "house bed" is handmade, and some additional furniture that is also in custom design, plus additional ornaments, the bedroom looks very minimalist but stylish. Design a dream bedroom with an eclectic concept that blends several designs. Kutikai, furniture specialist from natural plywood materials provide a selection of furniture that is very fitting for the dream bedroom design choice. Material plywood becomes a very fitting choice, suitable and practical enough for the child's bedroom. 1. For those of you who have younger sons who start teenagers, whether it is at the age of 10 to 16 years, and confusion how should interior roomy. Here are some interior inspirations that you can apply to children. 2. As you know that the transition from childhood to teen is a critical moment. Often in these times, your child begins to not like being home all the time, so the thing they need most at home is comfort. 3. One of the things you can do to facilitate your child's needs by providing the bedroom as comfortable as possible. 4. Teenagers generally love the modern style. 5. Do not forget to adjust the interior design of your child's room with their personality and likes to make sure they will feel comfortable and happy to be in it.Good luck!